In a way that isn’t healthy. I tend to talk myself out of where God wants me to be. You see, I didn’t finish bible college. I have some, but not a lot of higher level musical or writing training. I have read a great deal of works that have helped shape me, but not had a close mentor for the past few years. Despite all that, God is still calling me to move ahead with a purpose. And we know that in all things God works for the good of those who love him, who have been called according to his purpose. For those God foreknew he also predestined to be conformed to the image of his Son, that he might be the firstborn among many brothers and sisters. And those he predestined, he also called;those he called, he also justified; those he justified, he also glorified. Brothers and sisters, think of what you were when you were called. Not many of you were wise by human standards; not many were influential; not many were of noble birth. But God chose the foolish things of the world to shame the wise; God chose the weak things of the world to shame the strong. God chose the lowly things of this world and the despised things —and the things that are not— to nullify the things that are, so that no one may boast before him. When we live with ourselves, we can’t see what God sees in us…but we are seeing ourselves the way we were before coming into the Kingdom. Focusing our weaknesses and lack. God sees us as His vessels to fill, so we can pour His love out into the lonely, broken hearts of those struggling around us. Our weakness makes room for His strength. Our lack makes space for His more than able. He proves He is enough, when we know we aren’t enough without Him. Stop putting yourself down, and trying to disqualify yourself from what He has called you to be. If He called you to it, He will equip you for it. That might seem trite, but the Bible is filled of the people He used, despite their earthly disqualifications. Spend some time with Him, and ask Him to reveal if you need to break off any lie you have believed about not being good enough. If you believe He can’t use you until…..you have missed the point. He can use those willing to be used. Read through the following list of just a few of those God used…you may recognize yourself somewhere in these names. 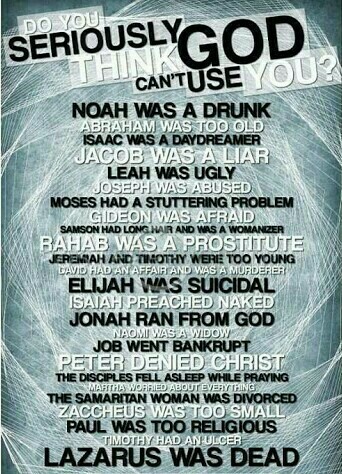 In the Kingdom, its about His ability, not our inability. Let Him remind you of the Hope you have in Him for all things, as you offer yourself to serve Him where He has called you. know what I’m doing. I have it all planned out—plans to take care of you, not abandon you, plans to give you the future you hope for.